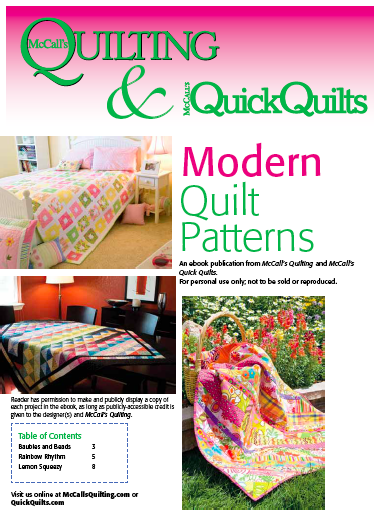 McCalls quilting have released a Free e-book with 3 modern quilt patterns. Baubles and Beads by Susan Guzman, Rainbow Rhythm by Tricia Camp and Lemon Squeezy by Sherri Driver. The three patterns are aimed at quilters with skill levels, beginners to the confident beginner. Simple piecing techniques, such as Quilt as You go and Half Square triangles (HST) are used in these quilts to provide a basis for making a modern quilt with endless possibilities using the one or mixed fabric collections or just simply solids. Each pattern comes with comprehensive instructions with excellent illustrations and hints. To obtain your free copy, go to the McCalls website found here and follow the prompts. Saw this today and shared with my quilt at work. Love the Lemon Squeezy for our charity quilts! Great eBook!!! !